Make the cake Preheat the oven to 350° and grease one tall (3" high) 8" round cake pan, or a standard 9" cake pan. Line with parchment paper. In a medium bowl, combine flour, sugar, baking powder, salt, and cardamom. Add in coconut milk, 1 cup of coconut oil, and vanilla extract. Mix to combine into a thick batter. Transfer the batter to the prepared cake pan and bake for about 40 minutes, or until it's golden brown and the edges are pulling away from the side of the pan. Cool for 10 minutes in the pan, then unmold and let cool completely at room temperature. Make the Whipped Coconut Cream Open the cans of coconut milk and carefully scoop out the top layer of cold, solidified coconut milk into the bowl of a stand mixer fitted with the whisk attachment. Reserve the remaining milk for another use. Add the vanilla extract and mix on medium-high speed until most of the lumps of coconut fat have broken up and soft-peaks have formed, about 5 minutes. Refrigerate or use immediately. Make the Berry Glaze In a medium bowl, combine the sugar and crushed berries, add the milk and whisk to combine. Add more berry powder to intensify the pink hue. Set the cake on a cooling rack set in a rimmed baking sheet. Pour the glaze over the cooled cake. 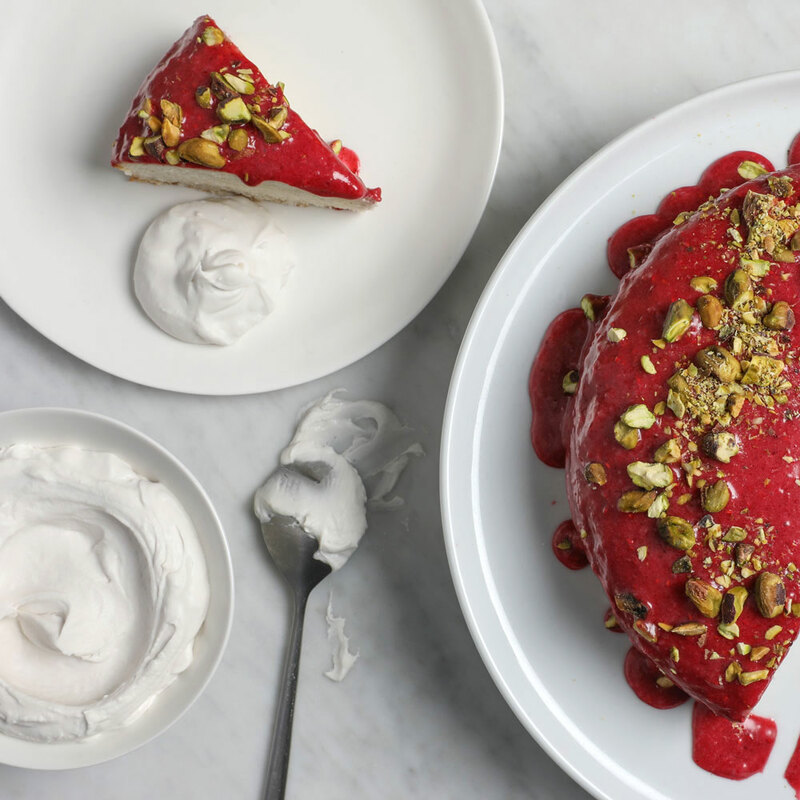 Top with whipped coconut cream and generously garnish with the chopped pistachios.